The inaugural class of VALOR visited and toured Liberty Mills Farm which is owned and operated by Kent and Evie Woods. Liberty Mills Farm spans 110 acres which was originally part of the Bloomingdale Farm, and is located in Orange County, just east of Rapidan River in Somerset, VA. Our view from the farm included a panoramic view of the Blue Ridge Mountains and surrounding countryside. The Woods operate a community supported agriculture program or CSA and have about eight acres of produce. They grow “everything from A (arugula) to Z (zucchini)” according to Kent and Evie who graciously led us on a tour of the farm. Their CSA runs about 20 weeks and also includes fresh flowers and fruits. They are also trying their hand at bee keeping and will be hopefully be offering honey. However, the CSA is not what makes this farm so special; it is the fact that it operates the largest corn maze in the state of Virginia. The corn maze encompasses about twenty acres. Visitors are provided a map for the maze and can choose to do the short maze which averages one to two hours or if they are up to a challenge, they can complete the entire maze which has twenty-two unique hole punches that they have to find and will take on average about 4 hours to complete. In addition to the corn maze they have numerous activities for the family to enjoy such as hay wagon ride, a pick your own pumpkin patch, hay bale maze and straw mountain. But the maze is not just for families, last year over 7,000 people went through the maze and included people from all over the United States and England, Washington D.C. Australia, the Middle East, and China. Evie and Kent said “that college age kids really have a blast! And we have had hosted company picnics, team building groups, employee appreciation events, youth groups and birthday parties”. Last year the maze includes all the State Colleges and University logo’s in the design. This year’s design has not been released yet. 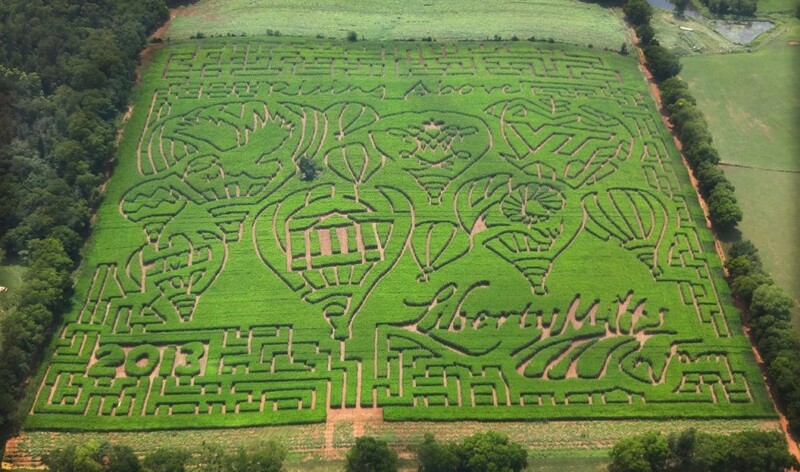 The corn maze opens in September and runs through the 1st weekend in November. You can find additional information about Liberty Mills Farm by visiting their website at http://www.libertymillsfarm.com and have a “farmtastic” adventure. Previous postIn Virginia There Is Wine, and In Vino Veritas. Next postEnd of a fantastic journey or start of something much greater?